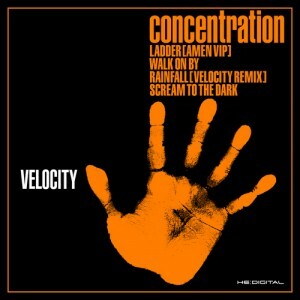 Japanese DJ/ Producer Velocity’s first EP, “Concentration EP” is being released on HE:Digital. All 4 tracks have grabbed the attention and support of major artists, such as Makoto, A-Sides and Random Movement etc. An expansive, melodic track that still maintains the sheer beauty of the original.Ladder by Velocity & Key MC from HEDIGI 008 “Something We Can Do”. Adding an Amen break along with various musical instruments such as piano, harp, strings and horns, the track is ready to blend on any occasion. A mellow & positive vibe tune, that while keeping the soulful feeling by combining guitar and rhodes, is also capable of smashing up the floor. With the breakdown switching to a half-step beat, this track keeps the ravers on their toes. This is a deep tune with a baseline that keeps you closed off deep underground. One of the best production from Velocity. Tight beats and smooth sample lines settle the track Scream To The Dark.